World over, widows and orphans experience new challenges day by day. It is touching to learn that they (widows and orphans) do not have the capacity to deal with these challenges that are unique to them. This month, while on a mission to reach out to the Bryce Homes families for distribution of foodstuff, we came across some good news which is worth sharing with our readers. Children in the Bryce Homes are naturally gifted uniquely and the little opportunity given to them can produce a great impact! 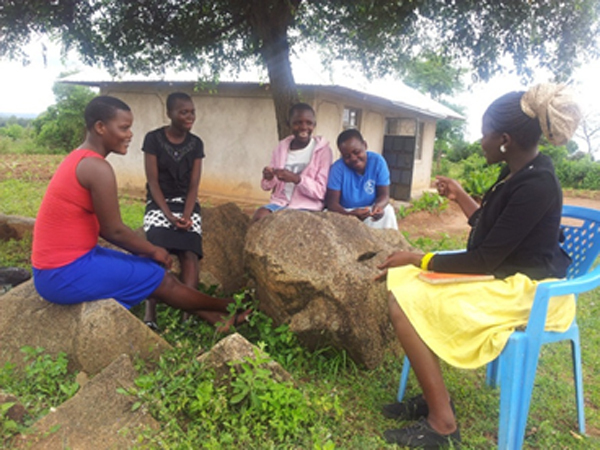 Eveline interviews the young girls (from Bryce Homes) who are at home on holidays. Eveline, a daughter in Bryce Home (BH #15) and graduate from college, pioneered a Bryce Homes Children Program (BHCP). BHCP gives the orphaned children an opportunity to use their talents for a sustainable future. Through this program all the children are grouped depending on their unique talents and specific training is provided relevant to each group. 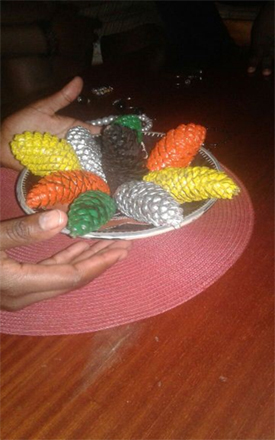 One such group of children have successfully produced ornamental items whose aesthetic values have attracted potential buyers. We are praying that the same products will soon fetch a market abroad for purposes of motivating them. 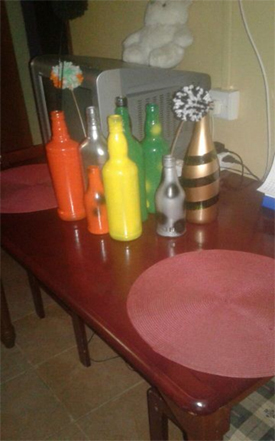 These are some of the beautiful crafts that Bryce Homes Children are making under the supervision of Evelyn. Another unique scenario is the case of a young athlete (Dorothy) who triumphed in steeple chase in the Kenya National Primary Schools Athletics Champions. Her success was as a result of motivation from the newfound children’s program (BHCP). Dorothy is a daughter to Terry (BH #6). 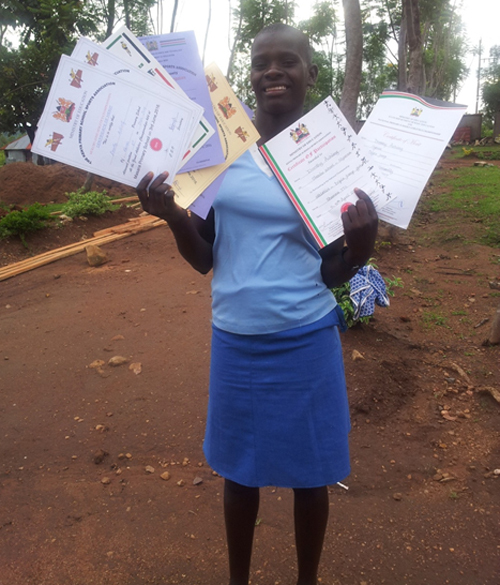 Dorothy is happily displaying her certificates of merit having successfully triumphed in athletics. 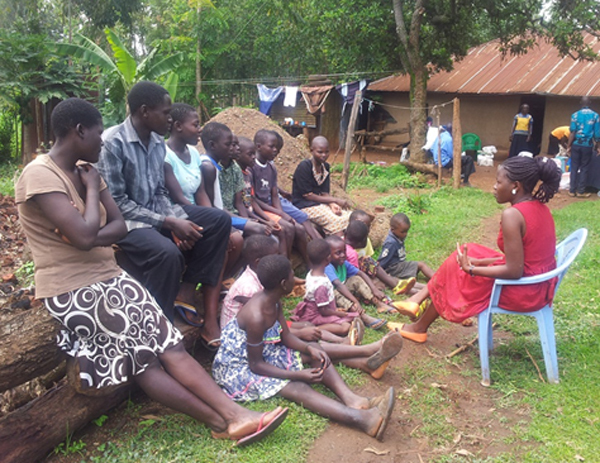 She also provides guidance and counseling to other children who would otherwise be hopeless in life. We, the Bryce Homes Board, greatly support the program. We also thank the donors and readers who have always provided and encouraged the Bryce Homes Program in Kenya. Guidance and Counseling in session. These children have amazing issues to share. In the same journey to a sustainable future, the Small Business Opportunity Program founded by the Bryce Homes Program continues to bear fruit for many widows who have remained persistent in doing business. One such widow is Phoebe (BH #26) who plants sweet potatoes for sale. She has recently raised good money out of her SBO and used it to buy clothes for her children. It is exactly the same SBO Program that enabled another widow, Finter (BH #13), to save proceeds from sales until she bought a dairy cow. Today, the cow produces gallons of milk and this earns her good money to pay school fees. 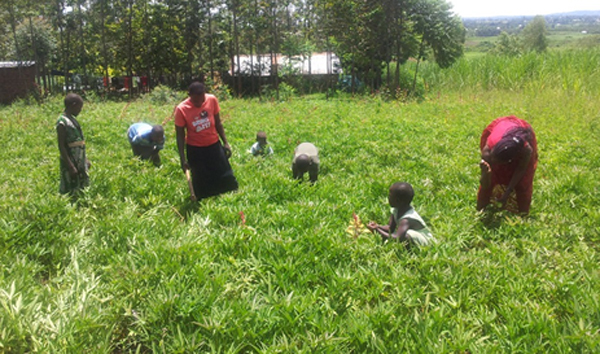 Phoebe (BH #26) with her children in her sweet potato farm. She shared with Evelyn how her little children benefit from the SBO. 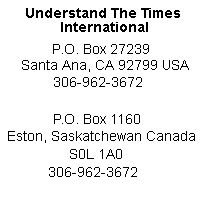 In conclusion, we encourage our international friends including readers to continue supporting programs such as Bryce Homes which have futuristic sustainability. This will enable all children of God to have a sense of belonging and hope for the future.